Russia retained its second place in global arms exports in 2014, with a 27% share. At a recently convened meeting of the Military-Industrial Committee on Military-Technical cooperation between Russia and foreign countries, chaired by President Vladimir Putin, arms manufacturers spoke of their performance in 2014, with optimistic forecasts for 2015. Armaments export orders have grown, but the volume of actual deliveries abroad has decreased, the Committee stated. Russian arms export orders have grown, actual arms deliveries abroad have decreased, yet Russia’s plans to develop and enter new arms markets has not suffered. In fact, the country has retained its long-time “honourable” second place in the global arms exports market, with a 27% share. President Vladimir Putin said that Russia’s current portfolio of arms export orders has grown by $1 billion, and is now valued at around $50 billion. The volume of actual deliveries, compared with 2013, remains virtually unchanged, surpassing $15 billion. The value of signed contracts has, however, decreased from $18 billion to $14 billion. He spoke after chairing a meeting with the Military-Industrial (MI) Committee on Military-Technical cooperation with foreign states. According to the Stockholm International Peace Research Institute (SIPRI), Russia’s “customer list”, of countries that import Russian weapons, has seen some serious changes. Syria and Venezuela fell off the list of Top-5 buyers of Russian armaments in 2014, while Azerbaijan and Iraq appeared on this list. 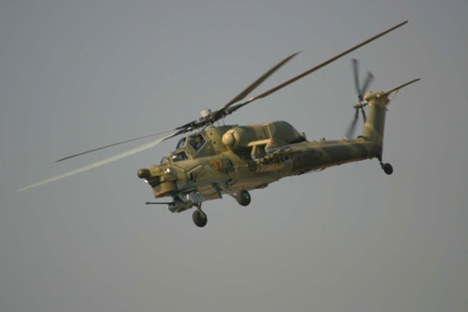 Russia concluded an impressive package of contracts worth more than $4 billion with Iraq in 2014, supplying the ‘Solntsepyok’ (blazing sun) flamethrower system and Mi-28NE attack helicopters to Baghdad. In 2014, the country also strengthened its position in Vietnam, which became one of the largest importers of Russian weapons, second only to India. China has dropped to third position, continuing to decrease its dependence on Russian arms. The kind of military equipment supplied to other countries also changed considerably. Russian land warfare equipment (like armoured vehicles), saw a rise in demand, with sales reaching $0.682 billion, along with warships, with sales reaching $0.66 billion. In 2013, importing nations did not seek surface hardware equipment. Russian aircraft and equipment has maintained its leading supply-side position, with the highest volume of sales to other countries in 2013 and 2014 ($2.906 and $2.874 billion, respectively). The largest agreements were for the supply of helicopters. In 2014, Russia supplied 63 Mi-17V-5 helicopters to Afghanistan and Mi-171-Sh helicopters to Peru. The contracting party for the Afghan order was the United States. In 2014, Russia entered and began to consolidate its position in new arms markets; in South-East Asia, Latin America and Africa. These are considered the most promising markets for export of Russian military equipment. The leadership believes that Russia’s presence in these military markets is likely to rise each year. Russia is holding talks with Indonesia to sell Su-35 aircraft to replace Jakarta’s aging air force fleet, and is in negotiations with Argentina, Nicaragua, Uruguay, and Peru on possible deliveries of new airplanes (Yak-130 and MiG-29 for Nicaragua). Russia focused attention last year on new kinds of interaction, including the development of co-production facilities. Russia particularly sought and expressed readiness to establish joint ventures and share defence technology with BRICS countries. In 2015, Russia and Brazil expect to sign a contract for the supply of combined short to medium range surface-to-air missile and anti-aircraft artillery weapons systems; the Pantsir S1; with the possibility of joint-production of sub-assemblies and accessories in Brazil. South America’s largest country will get a service centre for Russian-made helicopters in 2016. According to the Federal Service for Military and Technical Cooperation, Russia is likely to fulfil all its export obligations in 2015, and end the year with the same volume of arms sales as 2014. Given the current complicated international situation and the introduction of sanctions against Russia, which has resulted in a number of markets being closed to Russian arms exports, this could be viewed as a success for the national “defence” industry.